Sensitive and specific detection of biomarkers is a constant demand in biomedical sensing applications. Over decades, the detection of biomarkers (e.g. AFP, CEA, and PSA, etc.) in the clinical sites and research institutes mainly relied on immunoassays, where the antibodies were employed as molecular recognizing components. However, the antibodies are susceptible to temperature, and the storage of the antibodies is challenging especially in resource-limited regions. Besides, the production of antibodies is tedious, and the batch-to-batch variation is also a concern. To overcome these limitations, oligopeptides are promising candidates to replace antibodies as molecular receptors due to their abilities in molecular recognizing and the flexibility in sequence designing. In this chapter, we first introduced the screening approaches to obtain the oligopeptide sequence possessing the highest binding affinity to the target molecules. Next, we briefly reviewed the recent applications of oligopeptides for in vitro detection of protein biomarkers, tumor cells, and proteases, respectively. 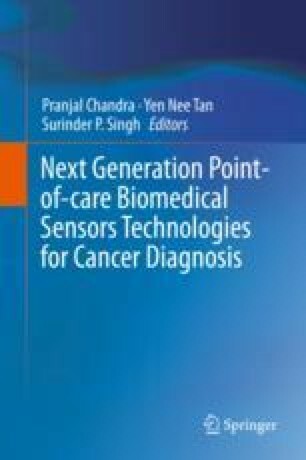 These advances of oligopeptides for biomedical sensing applications shed light on the next generation point-of-care biomedical sensors technologies for cancer diagnosis. We would like to thank http://muchong.com/ in gathering the relevant literature which are not accessible from the author’s affiliation.